Electricians were originally people who demonstrated or studied the principles of electricity, often electrostatic generators of one form or another. In the United States, electricians are divided into two primary categories: linemen, who work on electric utility company distribution systems at higher voltages, and wiremen, who work with the lower voltages utilized inside buildings. Wiremen are generally trained in one of five primary specialties: commercial, residential, light industrial, industrial, and low-voltage wiring, more commonly known as Voice-Data-Video, or VDV. Other sub-specialties such as control wiring and fire-alarm may be performed by specialists trained in the devices being installed, or by inside wiremen. Electricians are trained to one of three levels: Apprentice, Journeyman, and Master Electrician. In the US and Canada, apprentices work and receive a reduced compensation while learning their trade. They generally take several hundred hours of classroom instruction and are contracted to follow apprenticeship standards for a period of between three and six years, during which time they are paid as a percentage of the Journeyman's pay. Journeymen are electricians who have completed their Apprenticeship and who have been found by the local, State, or National licensing body to be competent in the electrical trade. Master Electricians have performed well in the trade for a period of time, often seven to ten years, and have passed an exam to demonstrate superior knowledge of the National Electrical Code, or NEC. Service electricians are tasked to respond to requests for isolated repairs and upgrades. They have skills troubleshooting wiring problems, installing wiring in existing buildings, and making repairs. Construction electricians primarily focus on larger projects, such as installing all new electrical system for an entire building, or upgrading an entire floor of an office building as part of a remodeling process. Other specialty areas are marine electricians, research electricians and hospital electricians. "Electrician" is also used as the name of a role in stagecraft, where electricians are tasked primarily with hanging, focusing, and operating stage lighting. In this context, the Master Electrician is the show's chief electrician. Although theater electricians routinely perform electrical work on stage lighting instruments and equipment, they are not part of the electrical trade and have a different set of skills and qualifications from the electricians that work on building wiring. In the film industry and on a television crew the head electrician is referred to as a Gaffer. Electrical contractors are businesses that employ electricians to design, install, and maintain electrical systems. Contractors are responsible for generating bids for new jobs, hiring tradespeople for the job, providing material to electricians in a timely manner, and communicating with architects, electrical and building engineers, and the customer to plan and complete the finished product. An electrician hooking up a generator to a home's electrical panel. Many jurisdictions have regulatory restrictions concerning electrical work for safety reasons due to the many hazards of working with electricity. Such requirements may be testing, registration or licensing. Licensing requirements vary between jurisdictions. An electrician's license entitles the holder to carry out all types of electrical installation work in Australia without supervision. However, to contract, or offer to contract, to carry out electrical installation work, a licensed electrician must also be registered as an electrical contractor. Under Australian law, electrical work that involves fixed wiring is strictly regulated and must almost always be performed by a licensed electrician or electrical contractor. A local electrician can handle a range of work including air conditioning, data, and structured cabling systems, home automation & theatre, LAN, WAN and VPN data solutions, light fittings and installation, phone points, power points, safety inspections and reports, safety switches, smoke alarm installation, inspection and certification and testing and tagging of electrical appliances. Electrical licensing in Australia is regulated by the individual states. In Western Australia the Department of Commerce tracks licensee's and allows the public to search for individually named/licensed Electricians. Currently in Victoria the apprenticeship last for four years, during three of those years the apprentice attends trade school in either a block release of one week each month or one day each week. At the end of the apprenticeship the apprentice is required to pass three examinations, one of which is theory based with the other two practically based. Upon successful completion of these exams, providing all other components of the apprenticeship are satisfactory, the apprentice is granted an A Class licence on application to Energy Safe Victoria (ESV). An A Class electrician may perform work unsupervised but is unable to work for profit or gain without having the further qualifications necessary to become a Registered Electrical Contractor (REC) or being in the employment of a person holding REC status. However, some exemptions do exist. In most cases a certificate of electrical safety must be submitted to the relevant body after any electrical works are performed. Safety equipment used and worn by electricians in Australia (including insulated rubber gloves and mats) needs to be tested regularly to ensure it is still protecting the worker. Because of the high risk involved in this trade, this testing needs performed regularly and regulations vary according to state. Industry best practice is the Queensland Electrical Safety Act 2002, and requires six-monthly testing. Training of electricians follows an apprenticeship model, taking four or five years to progress to fully qualified journeyman level. Typical apprenticeship programs consists of 80-90% hands-on work under the supervision of journeymen and 10-20% classroom training. Training and licensing of electricians is regulated by each province, however professional licenses are valid throughout Canada under Agreement on Internal Trade. An endorsement under the Red Seal Program provides additional competency assurance to industry standards. In order for individuals to become a licensed electricians, they need to have 9000 hours of practical, on the job training. They also need to attend school for 3 terms and pass a provincial exam. This training enables them to become journeyman electricians. Furthermore, in British Columbia, an individual can go a step beyond that and become a “FSR”, or field safety representative. This credential gives the ability to become a licensed electrical contractor and to pull permits. The various levels of field safety representatives are A,B and C. The only difference between each class is that they are able to do increasingly higher voltage and current work. Restricted electrical licenses are also issued for specializations such as motor winder, appliance repair, audio/visual installation and HVAC installation. The Electricity at Work Regulations are the statutory document that covers electrical installations. Further information is provided in the non-statutory document BS7671 - Requirements for Electrical Installations otherwise known as the Wiring Regulations currently (2013) in their 17th Edition. Installations that comply with BS7671 are deemed to have met the EAWR. Electrical Installation in domestic properties is governed by Part P of the Building Regulations and electricians have to register certain aspects of their work in domestic properties with the local building control authority. An electrician upgrades service on a multi-family house from two meters to four. The United States does not offer nationwide licensing and electrical licenses are issued by individual states. There are variations in licensing requirements, however, all states recognize three basic skill categories: level electricians. Journeyman electricians can work unsupervised provided that they work according to a master's direction. Generally, states do not offer journeyman permits, and journeyman electricians and other apprentices can only work under permits issued to a master. Apprentices may not work without direct supervision. Before electricians can work unsupervised, they are usually required to serve an apprenticeship lasting from 3 to 5 years under the general supervision of a Master Electrician and usually the direct supervision of a Journeyman Electrician. Schooling in electrical theory and electrical building codes is required to complete the apprenticeship program. Many apprenticeship programs provide a salary to the apprentice during training. A Journeyman electrician is a classification of licensing granted to those who have met the experience requirements for on the job training (usually 4080 to 6120 hours) and classroom hours (about 144 hours). Requirements include a two-year relevant degree, completion of two to six years of apprenticeship training, and passing a licensing exam.}. An electrician's license is valid for work in the state where the license was issued. In addition, many states recognize licenses from other states, sometimes called interstate reciprocity participation, although there can be conditions imposed. For example, California reciprocates with Arizona, Nevada, and Utah on the condition that licenses are in good standing and have been held at the other state for five years. Nevada reciprocates with Arizona, California, and Utah. Maine reciprocates with New Hampshire and Vermont at the master level, and the state reciprocates with New Hampshire, North Dakota, Idaho, Oregon, Vermont, and Wyoming at the journeyman level. 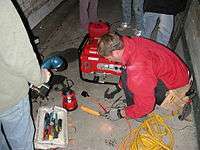 Electricians use a range of hand and power tools and instruments. Two of the tools commonly used by electricians. The fish tape is used to pull conductors through conduits, or sometimes to pull conductors through hollow walls. The conduit bender is used to make accurate bends and offsets in electrical conduit. Conduit Bender: Bender used to bend various types of Electrical Conduit. These come in many variations including hand, electrical, and hydraulic powered. Lineman's Pliers: Heavy-duty pliers for general use in cutting, bending, crimping and pulling wire. Diagonal Pliers (also known as side cutters or Dikes): Pliers consisting of cutting blades for use on smaller gauge wires, but sometimes also used as a gripping tool for removal of nails and staples. Cable Cutters: Highly leveraged pliers for cutting larger cable. Armored Cable Cutters: Commonly referred to by the trademark 'Roto-Split®' , is a tool used to cut the metal sleeve on MC (Metal Clad) cable. Multimeter: An instrument for electrical measurement with multiple functions. It is available as analog or digital display. Common features include: voltage, resistance, and current. Some models offer additional functions. Unibit or Step-Bit: A metal-cutting drill bit with stepped-diameter cutting edges to enable convenient drilling holes in preset increments in stamped/rolled metal up to about 1.6mm (1/16 inch) thick. Commonly used to create custom knock-outs in a breaker panel or junction box. Cord, Rope or Fish Tape. Used to manipulate cables and wires through cavities. The fishing tool is pushed, dropped, or shot into the installed raceway, stud-bay or joist-bay of a finished wall or in a floor or ceiling. Then the wire or cable is attached and pulled back. 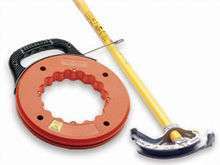 Crimping Tools: Used to apply terminals or splices. These may be hand or hydraulic powered. Some hand tools have ratchets to insure proper pressure. Hydraulic units achieve cold welding, even for aluminum cable. Insulation Resistance Tester: Commonly referred to as a Megger, these testers apply several hundred to several thousand volts to cables and equipment to determine the insulation resistance value. Knockout Punch: For punching holes into boxes, panels, switchgear, etc. for inserting cable & pipe connectors. GFI/GFCI Testers: Used to test the functionality of Ground-Fault Interrupting receptacles. Voltmeter: An electrician's tool used to measure electrical potential difference between two points in an electric circuit. Other general-use tools include screwdrivers, hammers, reciprocating saws, drywall saws, flashlights, chisels, tongue and groove pliers (Commonly referred to as 'Channellock®' pliers, a famous manufacturer of this tool) and drills. In addition to the workplace hazards generally faced by industrial workers, electricians are also particularly exposed to injury by electricity. An electrician may experience electric shock due to direct contact with energized circuit conductors or due to stray voltage caused by faults in a system. An electric arc exposes eyes and skin to hazardous amounts of heat and light. Faulty switchgear may cause an arc flash incident with a resultant blast. Electricians are trained to work safely and take many measures to minimize the danger of injury. Lockout and tagout procedures are used to make sure that circuits are proven to be de-energized before work is done. Limits of approach to energized equipment protect against arc flash exposure; specially designed flash-resistant clothing provides additional protection; grounding (earthing) clamps and chains are used on line conductors to provide a visible assurance that a conductor is de-energized. Personal protective equipment provides electrical insulation as well as protection from mechanical impact; gloves have insulating rubber liners, and work boots and hard hats are specially rated to provide protection from shock. If a system cannot be de-energized, insulated tools are used; even high-voltage transmission lines can be repaired while energized, when necessary. 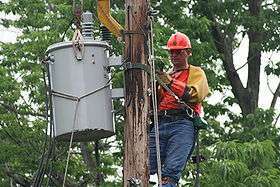 Electrical workers, which includes electricians, accounted for 34% of total electrocutions of construction trades workers in the United States between 1992–2003. Working conditions for electricians vary by specialization. Generally an electrician's work is physically demanding such as climbing ladders and lifting tools and supplies. Occasionally an electrician must work in a cramped space or on scaffolding, and may frequently be bending, squatting or kneeling, to make connections in awkward locations. Construction electricians may spend much of their days in outdoor or semi-outdoor loud and dirty work sites. Industrial electricians may be exposed to the heat, dust, and noise of an industrial plant. Power systems electricians may be called to work in all kinds of adverse weather to make emergency repairs. Some electricians are union members and work under their union's policies. Electrical Contractors can be represented by Master Electricians New Zealand. Electricians can choose to be represented by the Electrical Trade Union (ETU). Electrical Contractors can be represented by the National Electrical & Communications Association or Master Electricians Australia. Some electricians are union members. Some examples of electricians' unions include the International Brotherhood of Electrical Workers, Canadian Union of Public Employees, and the International Association of Machinists and Aerospace Workers. The International Brotherhood of Electrical Workers provides its own apprenticeships through its National Joint Apprenticeship and Training Committee and the National Electrical Contractors Association. Many merit shop training and apprenticeship programs also exist, including those offered by such as trade associations as Associated Builders and Contractors and Independent Electrical Contractors. These organizations provide comprehensive training, in accordance with U.S. Department of Labor regulations. In the Republic of Ireland there are two self-regulation/self certification bodies RECI Register of Electrical Contractors of Ireland and ECSSA. ↑ Roger Jones (2004). Electrician. Trotman Publishing. ISBN 0-85660-997-8. ↑ Tester, Ross (2008-06-05). "DIY Electrical Work: Are Aussies DUMBER than Kiwis?". Silicon Chip Online. Retrieved 2012-07-20. 1 2 Hering, Bob. "Differences Between a Journeyman & a Master Electrician". Houston Chronicle. Demand Media. Retrieved 10 April 2013. ↑ "Glossary of Electrical Terms". Nashville Electrician | Mister Sparky Electric. Retrieved 2015-10-20. Wikimedia Commons has media related to Electricians.